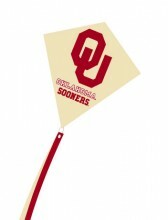 Show off your school spirit with these officially licensed college kites. College Diamonds make it easy to fly your colors high! Perfect for play at tailgate parties and decorating your game room.